Ideal for indoor or outdoor use. Perfect for picnics, BBQs & camping holidays! 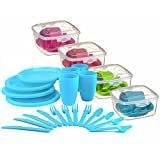 21 Piece Picnic Set may contain a lot of dinnerware but it’s incredibly lightweight, packs away neatly and compact and is easy to carry. The set comes in a storage box. Easy to clean, re-usable and durable. Comes in assorted colours, randomly sent. This entry was posted in Camping and Caravan Supplies and tagged Camping, Cutlery, Dinner, Party, Picnic, Piece, Plastic, Plate, STORAGE by The Camping And Caravanning Site. Bookmark the permalink.